Today’s post is about a wildly popular life quote that is often misattributed to Abraham Lincoln. Follow along to learn who really said it as well as who is spreading this misinformation across the internet and in modern literature. According to Herndon (Lincoln’s friend and law partner), Lincoln attributes this quote to an old man named Glenn in Indiana. Since there have been multitudes of people named Glenn in Indiana and no other identifying information is provided, we can only attribute this quote to unknown. 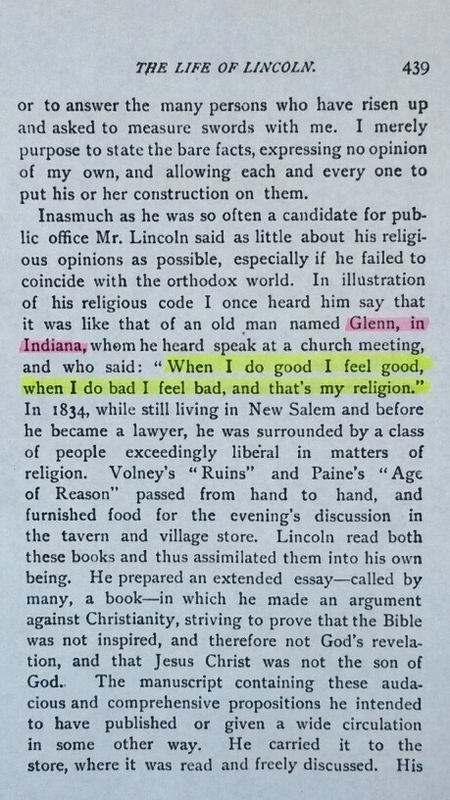 Of course, it could be attributed to “old man Glenn in Indiana,” but this ultimately leads to “unknown.” Here is the quote found in Herndon’s Lincoln: The True Story of a Great Life, volume III, chapter XIV first published in 1889. The quote virus is having a field day with this quote. After surveying 160 websites (and there were many more) featuring today’s misquote, I found the following trends. Based on the above statistics, websites with the sole purpose of providing quotes are the main source of this misquote. Also note that websites which provide quotes as a major feature of their functionality make up 15 percent. Combine these two categories, and 55 percent of these websites are major quote repositories. This means the main cause of the spread of this misinformation is online quote databases. The moral of the story is never use a quote website as a source for quotes. They are rife with inaccurate data and are extremely unreliable. The confusion with this quote is that, according to Herndon, Lincoln did indeed utter these words, but he prefaced them with an attribution to Glenn of Indiana. Somewhere in time, this part of the quote got eliminated. And without this key information, the assumption is that Lincoln himself said it. Voila! A misquote is born. I found that most books during the late 1800s and early 1900s featuring this quote include the correct attribution; however, I did find one book titled Thomas Paine: The Apostle of Liberty by John E. Remsburg published by The Truth Seeker Company in 1917 that omitted the attribution. I don’t know if this is exactly when the misquote started, but it may have contributed to it. I have encountered this type of misquote metamorphosis before. My 12/31/14 post Squire Bill Widener vs. Theodore Roosevelt is a similar situation. Theodore Roosevelt clearly attributes a quote to Squire Bill Widener, but over time, this attribution is eliminated, and another misquote is born. Because this particular quote is not written or published by Lincoln himself and is merely an ear-witness account, it is hearsay which means its validity is weak. As we all know, human memory is not always accurate, so when a quote is derived from someone claiming to have heard it, it is not reliable. I’m not implying that today’s quote is untrue; I’m just pointing out that its source is weak. For all we know, the wording is incorrect because Herndon had a bad memory, or maybe Glenn from Indiana is actually Ben from Alabama because Herndon was hard of hearing. (smile, wink) I’m just saying there are many things that can go wrong in the transfer of information from one human to another, so hearsay quotes aren’t as reliable as direct quotes. I came across 37 books featuring today’s misquote, and four are quote books published between 2010 and 2014. Similar to quote websites, modern quote books are also unreliable. If a quote book is published after the inception of the internet, it is probably riddled with inaccurate information. Unfortunately, most contemporary quote book authors use the internet as their data source. The bottom line is only trust quote books that have detailed source information for each quote. This means the name of the author/orator should be accompanied by the name of the work in which the quote is found along with applicable source information such as chapter, verse, act, scene, line, stanza, etc. I came across a website with the tagline “Fighting Ignorance Since 1973.” I find it humorous that while they’re fighting ignorance, this inaccurate information appears on their site. I guess the fight will be going on for a while. Here’s something that really cracked me up. A few quote websites append “(unconfirmed)” to the misquote. What’s hilarious is that NONE of the quotes on the website are confirmed! In reality, this comment should be appended to EVERY quote on the website. And, yes, I did spot other misquotes on each website featuring this comment. Apparently, some quote website administrator somewhere added “(unconfirmed)” to this misquote, and since most quote websites are duplicates of other quote websites, this new version is now beginning to take hold. This is not surprising because separate quote websites often feature the exact same quotes in the exact same order with the exact same misquotes with the exact same typos. As more and more quote websites are created, this duplication of misinformation spreads like a virus, and the next thing we know history is rewritten, and false data becomes fact. As usual, our misquote is available for purchase. For as little as $12.99, a canvas poster featuring the misquote in big, bold letters can be yours. Or for the interior designer, you can beautify your home by applying the misquote in vinyl lettering directly to your walls for just $59.99. Decisions! Decisions! The quote virus lives and thrives on the internet. It spreads its infection through quote websites and social media. A single person can start an epidemic by posting one misquote anywhere on the internet. If it is on social media, all followers spread it to their followers who spread it to their followers and so on. If it is on a quote website, it will be copied to quote books, social media, and other quote websites. The only way to kill the quote virus is through education. You can be a part of the solution by sharing the knowledge. If you’re on Facebook, you can “like” my Facebook fan page, and if you’re on Twitter, you can follow me @SueBrewton. If you’re not on social media, you can e-mail this article to friends and family. ← No, Clara Barton did not write that. 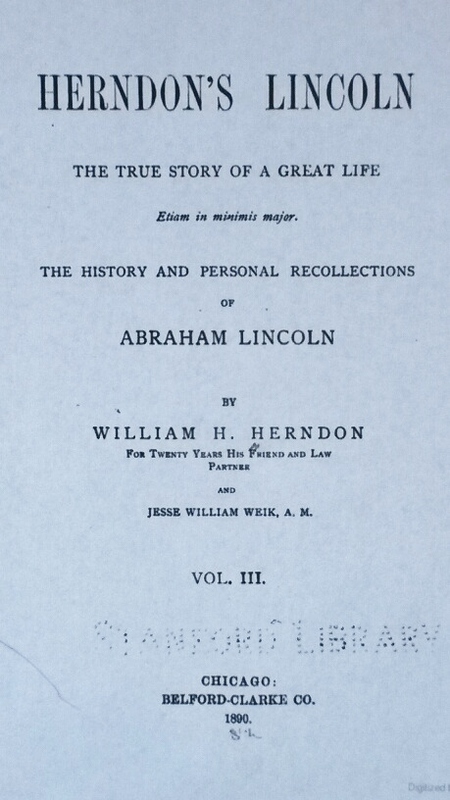 Note that Herndon’s statement inre Lincoln’s report of hearing a man named ‘Glenn’ say “When I do good I feel good, when I do bad I feel bad, and that’s my religion” is prefaced by Herndon’s statement that Lincoln stated that his ‘religious code’ is similar to the Glenn quote which means that regardless of its source “When I do good I feel good, when I do bad I feel bad, and that’s my religion” was similar if not identical to Lincoln’s ‘religious code. Good research. There are many “quotes” that people will rapidly pass on certain that they are passing along the truth. It’s the nature of the modern world and the (mis)information superhighway. It’s also the possible threshold of a darker time when people might no longer even bother to check if something is actually true and correct when they are so quickly supplied with answers right at their fingertips. A false history and so a false collective memory is then created. “Who controls the past” (and the way we perceive that past) controls the future and whoever is the loudest and quickest to supply the “answers and quotes” to the public – will be controlling the present. And thus the past and thus our future. Wow! What a profound comment. Love it! I certainly hope we are not crossing a “threshold of a darker time.” I’m doing my best to thwart it. Thanks again for the deep thoughts and the encouraging words. I really appreciate it. Really informative page, full of great information.